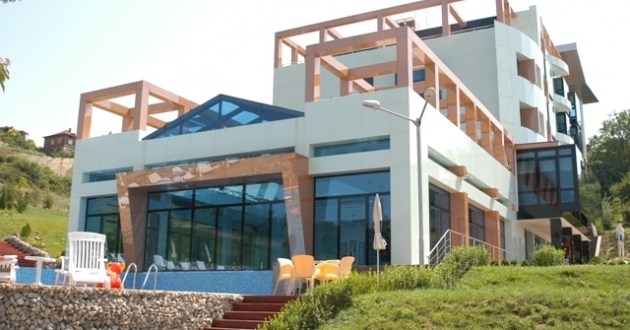 Location: Medite SPA hotel is located close to Sandanski, in the footsteps of Pirin Mountain, on the land of the former botanical garden with glamorous, scenic cityscape. Accommodation: 10 double rooms, 20 luxury rooms, 4 standard apartments and 2 luxury apartments, all with Sat-TV, mini-bar, Internet and wireless net, telephone, central A/C, sound-wired bathroom/WC, hairdryer. In the hotel: Restaurant and a large open-air terrace, pool bar and cocktail bar. Outdoor and indoor swimming pools, modern vertical turbo solarium, outdoor children's corner and a modern SPA & wellness center, room service, laundry and ironing, free transport to the town center are available.